I have always believed that anyone can learn to crochet, so long as you follow one simple rule: don’t try to run before you can chain! The chain is the most simple of stitches and therefore ideal for practising the all-important hold, which helps create the perfect tension for forming all the following stitches. When my mother taught me to crochet, she followed her grandmother’s lead and helped me to hook metre upon metre of chain before I was shown any further stitches. It was a fantastic foundation for learning the more difficult techniques. Once your chains are looking even and feel comfortable to create, then progressing on to the next stitches is much easier. If at any point you feel as if you have lost your hold, go back to those comforting lengths of chain until your confidence returns. 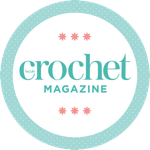 My biggest tip is to remember that this wonderful craft is well known for being relaxing and fun, which is why crochet is completely addictive, so enjoy it!